Turkey’s top government officials on Monday blasted U.S. President Donald Trump’s move to formally recognise Israeli sovereignty over the Israel-occupied Golan Heights, pro-government Hürriyet newspaper reported. "The US has once again ignored international law. However, this decision will never legitimize Israeli occupation. On the contrary, it will further increase tensions in the region by preventing peace efforts in the Middle East,’’ Minister of Foreign Affairs Mevlüt Çavuşoğlu said on Twitter. Çavuşoğlu went on to say that Turkey does not accept the decision by Washington. "We are opposed to this signature, this decision and it is not possible for us to accept this. The fact that our relations are in such a state with Syria does not require that we accept such a decision,’’ the foreign minister said. "He has turned this into a show as though it is a great accomplishment,'' Çavuşoğlu added, in an apparent reference to Trump's proclamation signing ceremony, noting that the move is the U.S. president's ''election gift'' to Israeli Prime Minister Benjamin Netanyahu, who is facing elections next month. Ruling Justice and Development Party (AKP) Spokesperson Ömer Çelik said that for those defending Israel’s right to defend itself, Turkey says its stands with the rights of the Palestinian people to live with dignity. "Nobody should doubt that Turkey will stand against this decision to the very end. That signature that President Trump signed is an illegal decision,’’ Çelik said. Turkey’s pro-government news outlets, such as CNN Türk and A Haber, reported on Ankara’s response to the U.S. move as breaking news and covered the Israeli strikes on Gaza with live comments. A Haber, which is closely linked to the ruling palace, continues to carry the Israeli strikes live. Trump’s move to officially recognise Israeli sovereignty over the occupied Golan Heights, captured from Syria in 1967, reverses decades of U.S. diplomacy on the region. Israel annexed the area in 1981 in a move not recognised internationally. 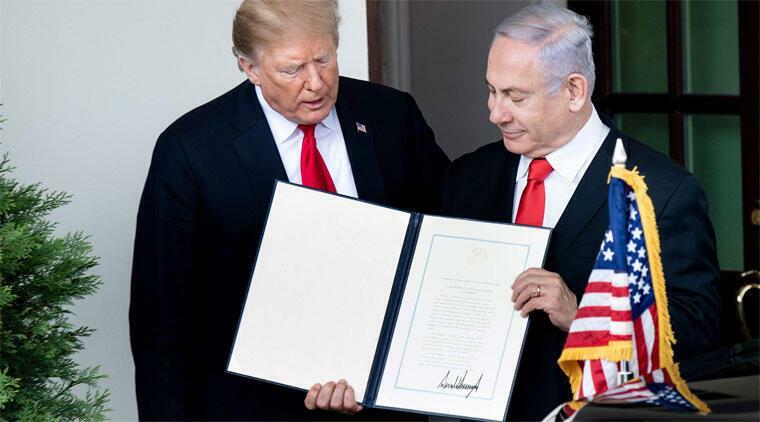 Netanyahu was by Trump's side as he signed the proclamation on Monday, calling the move "historic justice," BBC reported. Syria has called Trump’s decision "a blatant attack on its sovereignty." United Nations Secretary-General Antonio Guterres said he was "clear that the status of Golan has not changed," while staunch Syria-backer Russia warned the move could "drive a new wave of tensions in the Middle East region."